I have written this blog post in my head a thousand times. The first time was a year ago today when I realised it was my dad’s birthday, and that that meant that one week later, he would have been dead five years. Five years…that seemed an awful long time when I had done so little to really remember him. And I couldn’t do it. At that point, in a hotel bar with a gin in my hand, it hit me quite hard – maybe it was the environment – a place that I would inevitably always associate with him. But the fact that he had been gone for 5 years made it feel like it was yesterday! Where had that time gone? Despite many years of ill health, his death came suddenly and very quickly when Ella was only 4 months old. Everybody’s world is turned upside down overnight. You get through it, you do what you need to do, and you carry on with your life, which at this point includes trying to learn how to keep a tiny baby alive. But when somebody is gone, sometimes that is when you really get to know them. I had spent so little time with him when he was alive, that I have found reflecting on him and discovering more about him and our family after his death, has made understand a lot more about him and where I come from. So here it is. My tribute to him – Mein Daddy – who in his quiet, unorthodox and unassuming way taught me so much. So the story goes, that it all began at the bottom of the kitchen stairs in the Dolphin and Anchor Hotel in Chichester. 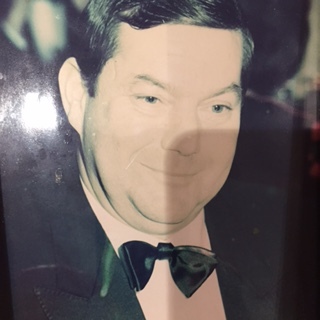 My dad – a young German preferring the English hospitality industry to the German Navy, had had a drink or two – now there’s a surprise, and he fell from top to bottom into the arms of my dear mother. Of course in true Hollywood style she nursed him back to health, and the rest, as they say, is history. The path to the registry office wedding in Bad Nauheim, quiff and winkle pickered up, wasn’t uncomplicated – my mum tried to give him the slip, but his heart was set, and ultimately she succumbed to his good looks and heavily accented one liners and became Frau Cuntze! It must have been love. Shortly thereafter they returned to England to train as hoteliers and were running an ancient coaching inn in Cambridgeshire when I bounced into their lives. Nic followed only 15 months later, and for whatever reason we found ourselves on our way back to Germany. By my fifth birthday it had all gone wrong. I know not why, I don’t want to know why – my mum has dropped snippets here and there and my dad always kept his counsel. But ultimately, my sister and I returned to England with my mum – my dad stayed in Germany. How could he not. He had built up, with my mum, a successful hotel business. He had ambition, he thought he was on his way, and he was. A second hotel followed a few years later, he worked damn hard and he lived a lovely life. A second wife also followed. They had a happy and successful 17 years together, and then it all started to go pear-shaped. The business and the marriage. If my dad had any faults it was probably to trust the wrong people. In what seemed like a matter of months it was all gone. The next time I saw my dad, he was dressed in overalls, living in a one bedroomed apartment, in a small hotel in Bad Pyrmont, trying to get another business off the ground. He still took absolute pride in everything he did – everything was clean and standards high, and he got up at 6 every morning to do the breakfasts, even if they only had one guest. But it never really happened. By now he was in his 50s, his health had been poor for almost 25 years, and it was a big ask. So, he returned to the village of his birth, the village of so many of our childhood memories and ultimately, to all intents and purposes, the village of his death. He moved into the family home – now owned by his brother, and retired gracefully from public life. Throughout our childhood my sister and I spent no more than 3 weeks a year in Germany, usually at Easter dodging marzipan based products, bored and slightly uncomfortable with the whole arrangement. My dad would come over when he could, business allowing, usually with a Mercedes boot full of Tuborg, but it really wasn’t a lot in the way of quality daddy/daughter time. His job meant that even while we were visiting him in Germany one to one time was usually limited to a Sunday visit to Gieselwerder to bask in my Oma’s incredible cuisine, or a hurried excursion to one of the local places of interest – the Edertal – one of the damns that got busted or the East German border and it’s escapee shooting fences! Such fun! Ironically the best day trip we ever had was to a place called Fort Fun! I’ve never been so pleased to see a log flume. Evenings were spent plonked on a bar stool in either the Schweizer Huettli or the Schloss Shaenke – the hotel bars at our disposal. To be fair, my sister and I never had a problem with that! Fanta on tap, brewery reps slipping us 10DM notes and patting us on the head affectionately, and endless fodder for our over active imaginations. Our favourite game was to pretend that the waiters in the hotel were race horses – they all had nick names – Basil, Hair Bear, Bionic Carrot and Curly Tops to name a few – and we commentated on them Peter O’Sullivan stylee very much to our own amusement, if no-one else’s Well it beat playing another game of Patience or watching the Great Escape for the 90th time on video! None of this really made for a close relationship with our dad unsurprisingly, but he never ever made us feel anything other than adored. He always made it absolutely clear that he missed us terribly. You were forbidden from leaving his presence without a kiss. He could never resist a stroke of your cheek. He would ask us endlessly when we were coming to see him. He would phone us religiously every Sunday, even though in the early years I had refused to talk to him. And he always sent us a postcard from whichever trade show or Kur he was at – with absolutely no news, and the same signature he used forever, Dein Daddy. As we got older and could share a beer or two, the barriers started to fall. Honest alcohol induced conversations, most of which I can barely remember. But always leaving me with a warm feeling that I had spent some quality time with my dad. Sober I always found him hard work to be honest – always wanting to fill the silence, and there was lots of that. But he was an affectionate and loving man, who loved a beer, to chuck your cheek and yell Yabbadabbadoo and above all just to be in our presence. At 30 he was diagnosed with rheumatoid arthritis – an awful disease from which he suffered for the rest of his life. Ultimately that was what killed him – at only 70 from kidney failure, by which point he had also lost a leg. But in those 40 years of ill health – I never heard him complain. Yes, he was clearly in pain – and not terribly mobile – but I never heard a ‘why me’, an angry word, or a self pitying moan. He bore his illness with more dignity than should even be possible. And I think he would have given up earlier if he hadn’t clung on to the sporadic and short visits from myself and Nic. Nic was of course devoted to him – she adored him, and she would have spent a lot more time with him had she been able, but we all have livings to earn, and to my shame, I went as little as my conscience allowed me. His health really started to deteriorate in the early noughties. We were summoned to Germany to say our good byes. My mum very loyally came with us. But in a remarkable twist of fate, she also rather generously had a heart attack while we were there!! She was very very lucky indeed to have survived that little incident, and amazingly they found themselves in neighbouring wards in the tiny cottage hospital in Lippoldsberg. Her mere presence was enough for my dad to rally and recover. My mum convalesced there for a couple of months, and we were frequent and regular visitors, mainly thanks to my British Airways Airmiles. So rather surprisingly we were given a second chance, and a miraculous one at that. But his rally was short lived. He was soon in and out of hospital again, and lived the last 5 years of his life in the same room, minus a leg, giving physios a hard time in a care home designed for much older people. Poor bugger! Of course, at this point, I was now very intent on starting my own family – a saga in itself which further reduced my visits, and it was with absolute delight that I finally boarded an Easyjet flight in February 2010 with my 3 month old gorgeous girl in arms, ready to show him off to her proud Opa. Unfortunately, we were all also on our way to my Uncle’s funeral, but one of my strongest motivations in sticking out the ‘having a baby’ process was to make my dad a proud Opa before his time was up, and finally that day had come. As I wheeled her in he looked a bit confused, but we wheeled him out and had a cup of coffee in the cafe downstairs. The photograph was taken! Ella and Opa. At last. As it turned out, it would be the one and only. We retired to our hotel, ready to collect him the next morning to take him to his brother’s funeral. But when we got there the next day, the nurses said he wasn’t well – he had a fever and couldn’t go. And that was that. He died that night. A sudden decline. But surrounded by probably the 4 most important people in his life other than his own mother – me, my sister, my mum and Ella. What more could he have wanted. What more could we have wanted for him, except a few more years. At this point my mum shows her true metal. Negotiating her way through German bureaucracy, with her self taught and perfect German grinding its way out. She gets done what needs to be done. We return a few months later, with a support crew, to pack up his flat. Quite a process with a 6 month old baby attached to you, I can tell you. But we carefully sifted through the memories and the mysteries..uncovered the clues to him as a man, him as a father and much much more. A folder with every single letter my sister and I had ever written to him carefully filed. His notes from his hotel training in Cheltenham, carefully kept. A box full of used stamps cut out of envelopes for whatever purpose they were meant. His autograph book from the Schloss Hotel packed with celebrity photos and signatures. And a wealth of historical documents I’d probably rather know less about. And then it’s all done. A massive chapter closes. We move on and reflect on the man we loved, the house in which he had been born, in which American soldiers had been billeted in the war, and around which the family had rowed when the damns had been busted. And we try to remember everything for posterity. And 6 years on, I can honestly say that the images are clearer than ever. My Oma in her tiny Kueche knocking up an Erdbeerkucken, Waffeln or Rouladen. The silent meals with my German speaking family, staring at us inquisitively, pittyingly, my Oma always with a tiny tear in her eye. The generous and sustaining vegetable garden and amazing cherry trees which gave of their fruit in abundance, the long strip of garden leading down to the mighty and majestic River Weser and the Campingplatz which brought the not just sleepy but comatose village to life in the summer. Wonderful memories. A story or two to go with each. Stories that maybe one day I will tell. Stories that Ella and Ben will certainly hear. And this summer we will return. With not one, but two grandchildren. We will visit family that we never knew before his death and who have come to mean so much. Yes, you Charlotte. And we will drink a beer in the Schwimbad, and raise a glass to the man that was Mein Daddy..Mein Daddy, Nic’s Daddy, and Ella and Ben’s Opa. And we will make sure that they know exactly who he was. I have great memories of your dad and Oma in Germany. I too have a fondness for Fort Fun! I could see just by watching how much he reciprocated the adoration of his girls with his smiles, kisses and hohohos. Beautifully written Heidi, I’m just wondering how on earth I missed the ‘how mum and dad met story’ before now?! Love it. Lovely Heidi – you will never forget your loving Dad. So many happy memories to cherish. Reblogged this on Smile and Wave Boys.